This article provides in-depth fundamental analysis of Granules India Ltd, a Hyderabad-based Indian integrated pharmaceutical manufacturer, which focuses on making active pharmaceutical ingredients (API), pharmaceutical formulation intermediates (PFI) and finished dosages (FD) as primary business activities. I have done the analysis as per your framework for Granules India Ltd. I am attaching results from framework and my views as well as certain red flags. I will appreciate if you can share your views especially on red flags found about company and also if I missed any key issue or parameter about company analysis. The company has generated wealth for shareholder consistent with ₹6 market cap for each ₹1 of retained earnings. The company got observations from few regulators which were never the case historically, but on the positive side, the company has already cleared from one European regulator showing quick response and focus from mgmt. and also indicating no major issues. Debt levels are higher than desired and SSGR is lower as well. How shall one look at these 2 factors? Change in rating agencies. Is that a cause for concern? Overall, Granules India Ltd looks to be a company on a growth path with a track record of sales and profitability growth. One need to keep a close watch on pledged shareholding, credit rating and PAT margins. 5 Creation of value for shareholders from the profits retained Increase in Mcap in last 10 yrs. > Retained profits in last 10 yrs. 6.38 RS OF Mkt cap created for each 1 rs of earning. Excellent. 3 Salary of promoters vs. net profits No salary increase with declining profits/losses Profit have been increasing, but promoter taking almost 10% of PAT as salary which is max limit allowed. 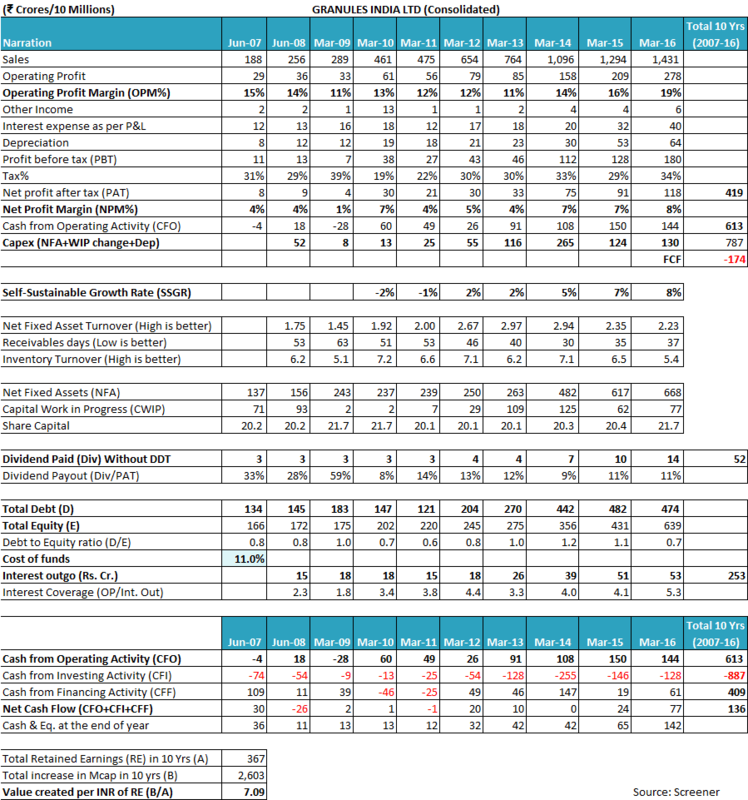 MoS in Business Model Self-Sustainable Growth Rate (SSGR) SSGR > Achieved Sales Growth Rate 8%, less than sales growth rate, can this be a potential risk due to dependent on debt/equity to chase growth? 1 Credit Rating History BBB- & above CARE had suspending rating earlier. Seems co moved to India rating. Rating A+. While the rating is fine, moving to different rating agency a risk? Thanks for sharing your analysis with the author and readers of the website. Let us analyse the past financial performance of Granules India Ltd. It is preferable that while analysing any company, the investor should take a view about the entire entity including its subsidiaries if any, so that she is aware of the complete financial and performance picture of the company. 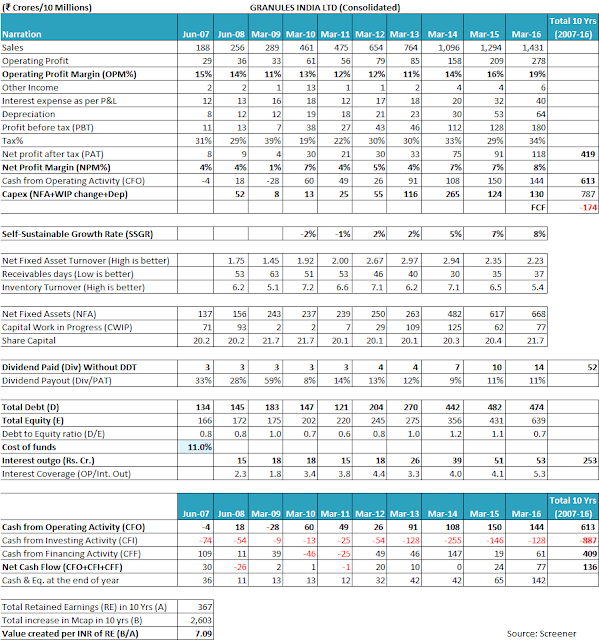 Therefore, while analysing the performance of last 10 years for Granules India Ltd, we have analysed the consolidated financial performance of the company. Therefore, it has become essential that the company invest in further capacity addition to paving the way for future growth. It remains to be seen whether the company is able to execute its planned capacity additions on time and within costs. It is important to notice that the operating profit margins (OPM) of Granules India Ltd, was following a cyclical pattern until FY2014 as visible from the OPM movement from 15% in FY2007 to 11% in FY2009, improving to 13% in FY2010 and again going down to 11% in FY2013. However, from FY2014 onwards, the OPM has been witnessing steady improvement and has steadily improved up to 19% in FY2016. It is essential to know that the primary products called as “Core Business” by Granules India Ltd constitute some of the most used drugs in the world. These drugs have already witnessed very high penetration in healthcare services and the probability of a further sharp increase in their market size does not look highly probable. These products: Paracetamol (reduced fever), Ibuprofen (pain killer), Metformin (lowers blood glucose for diabetics), Guaifenesin (cough syrup) and Methocarbamol (muscle relaxant), witness very mature markets with many big suppliers competing for the market. This results in poor pricing power in the hands of suppliers to pass on the raw material cost increases to buyers. This leads to fluctuation in the operating profitability margins with changes in the raw material prices. The net profit margins of Granules India Ltd have followed the similar cyclical pattern like OPM and have witnessed improvement in recent years. It is advised that the investor should keep a close watch on the profitability margins of Granules India Ltd.
Operating efficiency parameters of Granules India Ltd reflect that the net fixed assets turnover (NFAT) has been increasing from FY2008 to FY2013 when it improved from 1.70 to 2.97. However, since FY2013, the NFAT has been declining continuously and stands at 2.23 in FY2016. This essentially indicates that the investments done by Granules India Ltd since FY2014 onwards in various ventures, plants etc. are yet to bear full fruit and be utilized to optimal capacity. An investor would notice that the net fixed assets of Granules India Ltd have increased sharply from ₹263 cr. in FY2013 to ₹668 cr. in FY2016. The capacity expansion is still going on as the company has a capital work in progress (CWIP) of ₹77 cr at the end of FY2016. An investor should keep a continuous watch on the asset utilization levels as the continuous capex many times masks the suboptimal use of existing assets by companies. The managements always find a plausible explanation of lower NFAT citing reasons of new capex not leading to full utilization. However, it many times hides the poor utilization of previously done capital expenditures. Working capital efficiency parameters of Granules India Ltd reflect that since FY2014, the working capital efficiency has been deteriorating. The inventory turnover ratio (ITR) has declined from 7.1 in FY2014 to 5.4 in FY2016. Similarly, receivables days of Granules India Ltd have deteriorated from 30 days in FY2014 to 37 days in FY2016. An investor would notice that Granules India Ltd has raised its capex significantly since FY2014. It has acquired Actus Pharma Ltd in FY2014 and has also been investing in JVs (Omnichem) and acquisition overseas (Virginia, USA). These acquisitions and capex decisions seem to be weighing the operational efficiency parameters down. An investor should keep a close watch on the operating efficiency parameters going ahead to ascertain whether the investments by Granules India Ltd are working out in the favour of the company or not. It is advised that the investor should do her own analysis in arriving at conclusions in such cases and not rely on management statements as managements are known to defend their decision irrespective of the final outcome. Moreover, while analysing the receivables position of Granules India Ltd, when the investor compares the standalone and consolidated receivables position at March 31, 2016, then she notices that the subsidiaries of Granules India Ltd are collecting the receivables from their end customers but are not paying/remitting to Granules India Ltd on time. A comparison of above two images shows that about ₹46 cr is stuck with subsidiaries/JVs as the consolidated trade receivables are about ₹153 cr. and standalone trade receivables are about ₹199 cr. An investor should keep a close watch on developing receivables position to monitor the trend. An investor should focus on monitoring whether the company continues to park funds in its subsidiaries, which becomes evident from the relative rise in standalone receivables while consistent consolidated receivables. The investor would notice that Granules India Ltd has an SSGR almost in single digits (5%-8%) over the years, which is much lower than the sales growth rate of 20%-25% being achieved by the company. As a result, Granules India Ltd has to rely on additional sources of funds, both equity as well as debt, to fund its growth requirements. The analysis of debt levels of Granules India Ltd over last 10 years (FY2007-16) indicates that the debt of Granules India Ltd has increased from ₹134 cr. in FY2007 to ₹474 cr. in FY2016. Over and above the debt increase, the company has been diluting equity by way of issuing warrants to promoters at preferential terms (more on warrants issuance later in the article). This assessment assumes significance in conclusion that Granules India Ltd is growing faster than its means. It has already undertaken debt (and equity dilution) funded capital expenditures, which as discussed above are weighing down its operating efficiency parameters. It remains to be seen whether the company tries to focus more on improving the state of its existing operations to increase the utilization efficiency of capex already done or it goes for further capex. However, as mentioned by the management of Granules India Ltd in the conference call with analysts in Oct 2016, the company plans to increase its capital expenditure in coming years. An investor should keep in mind that as highlighted by SSGR being lower than the growth rate, each incremental growth part is going to burden the company with higher funds requirements over and above what it can generate internally, and as a result will burden the company with more debt and probably equity dilution. The assessment of SSGR gets substantiated when the investor analyses the free cash flow (FCF) position of Granules India Ltd.
An investor would notice that Granules India Ltd has generated ₹613 cr. from cash flow from operations (CFO) over last 10 years (FY2007-16) whereas it has spent ₹787 cr as capital expenditure over the same period resulting in a negative FCF of ₹174 cr. Moreover, the increasing debt of Granules India Ltd has ensured that it has to service a significant amount of interest each year. If an investor assumes 11% interest rate applicable to the debt of Granules India Ltd over last 10 years, then she would notice that the company paid about ₹253 cr. in interest payments to its lenders. Granules India Ltd has tried to meet this gap of ₹420 cr. by raising incremental debt of ₹340 cr. (₹474 cr. – ₹134 cr) and additionally relied on equity dilution to bridge the gap. The above analysis indicates that the past performance of Granules India Ltd does not indicate any sustained competitive business advantage in its business model. The rising debt continued equity dilution, deteriorating operating efficiency would put pressure on the credit rating assessment by any rating agency. It seems that the company has been doing credit rating shopping in the market by switching different rating agencies in quick succession. Granules India Ltd was initially rated by CARE (there is a publicly available rating rationale of the company prepared by CARE in June 2010). Thereafter, it switched from CARE to ICRA and as a result, CARE suspended its credit rating. Further, the company switched from ICRA to India Ratings and as a result, ICRA also suspended its rating. Such frequent shift in rating agencies can be due to any of the two considerations: (1) to save on costs by negotiate lower pricing by shifting the rating agency and (2) negotiate a better credit rating from another rating agency in case existing rating agency is not willing to give desired credit rating to the company. An investor should contemplate/explore further about the reasons for such frequent switching the rating agencies by Granules India Ltd. The above analysis of FCF indicates that Granules India Ltd is consuming more cash than its business model is able to generate, which is resulting in continuously increasing debt levels. It seems questionable that the company has been paying dividends every year despite being in a cash flow deficit situation. Granules India Ltd paid a total dividend (excluding tax DDT) of about ₹52 cr. over last 10 years (FY2007-16). Ideally, the company should have conserved resources and used the funds to repay debt, avoid equity dilution and fund the capex plans. Payment of dividends in companies, which have negative free cash flow (FCF) indicates that the dividends are effectively funded by debt. As the decision to pay dividend depends upon the promoters/majority shareholders, most of the times, such dividend payouts are to benefit promoters even though the dividends are received by all the shareholders. An investor would appreciate that payment of dividends out of debt proceeds effectively puts the company in an unnecessary leveraged position. It’s like benefiting the equity shareholders at the cost of the company. An investor would notice that the promoter of the company, Mr Krishna Prasad Chigurupati (CMD) took home a remuneration of about ₹10 cr in FY2016 and his wife Ms Uma Devi Chigurupati (Executive Director), received a remuneration of about ₹8 cr in FY2016. 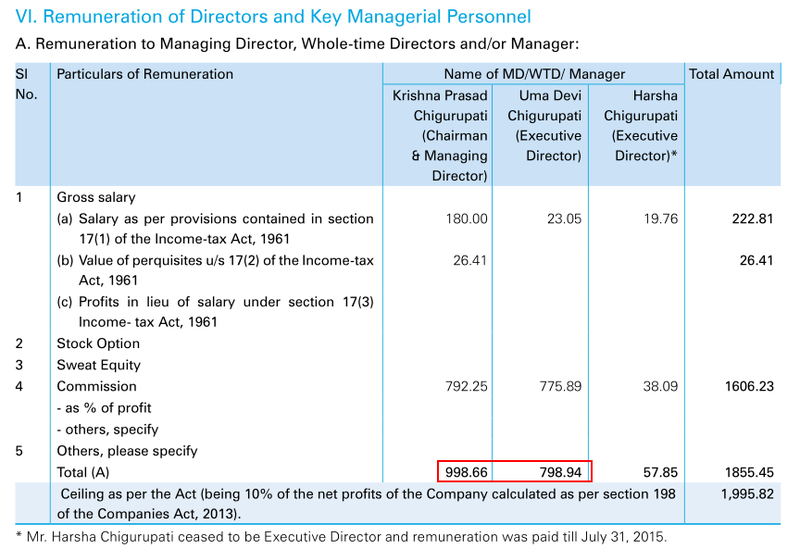 These salaries look very high from industry benchmark perspective despite being in statutory limits. This is after considering that the net profit after tax of Granules India Ltd in FY2016 was about ₹118 cr. Salary of Krishna Prasad is about 8.5% of PAT and the salary of Uma Devi is about 6.8% of the PAT in FY2016. We have noticed that on an average the promoter’s salaries are reasonable within the range of 2-5% of PAT, which includes fixed component as well as approximate 2% commission on the profits of the company. Considering it, the salaries drawn by promoters seem very high. Moreover, an investor would notice that the executive director, Ms Uma Devi Chigurupati does not seem to be dedicating her full-time attention to her role in Granules India Ltd. 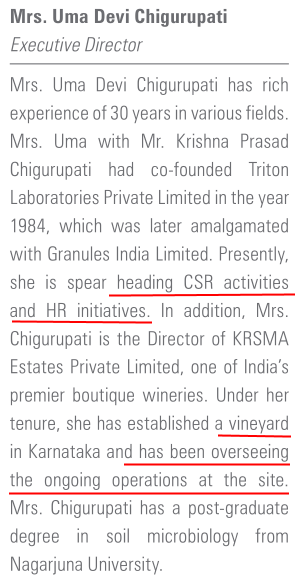 The annual report for FY2016 for the company mentions that she is also overseeing the operations of another business, which is a vineyard in Karnataka. 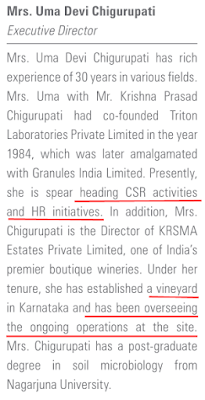 If the vineyard operations require much of her time, then the high salary being paid out to her from Granules India Ltd might not be entirely justified. An investor should analyse it further to arrive at a final conclusion as high remuneration to family members might be one of the ways in which the promoters might be benefiting at the expense of the company similar to the above-mentioned observation of payment of dividends out of debt proceeds. allows the promoters to increase their stake in the company through backdoor channels, without facing the increased cost of share acquisition. Usually, the cost of purchase of shares from the market is higher as the share price increases once the market gets to know that the promoter is purchasing shares. a) 40,95,230 warrants allotted on August 28, 2015, at ₹84.91, which were exercised by the promoters in full on October 31, 2015, when the closing market price of Granules India Ltd was ₹147.90 on October 30, 2015, on BSE. This led to the promoters benefiting by ₹25.7 cr. [40,95,230 * (147.90 – 84.91)]. This is assuming that the promoters would have been able to buy 40,95,230 shares at the market price, without factoring in the usual share price increase that results on the news of promoters buying shares in the company. Additionally, the daily trading of the shares of the company involves buying and selling of about 2.5 to 3.5 lakh shares, which is low considering the number of shares being gained by the promoters. 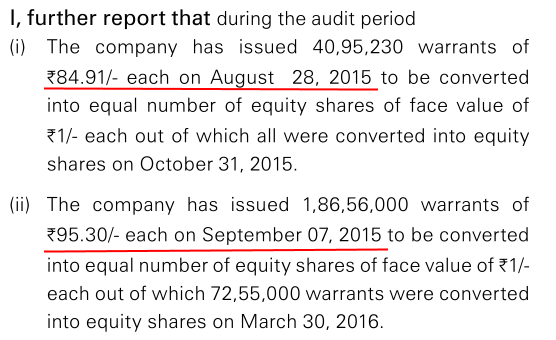 b) 1,86,56,000 warrants allotted on September 07, 2015 at ₹95.30, out of which 72,55,000 warrants were exercised by the promoters on March 30, 2016, when the closing market price of Granules India Ltd was ₹119.70 on BSE. This led to the promoters benefiting further by ₹17.7 cr. [40,95,230 * (147.90 – 84.91)]. 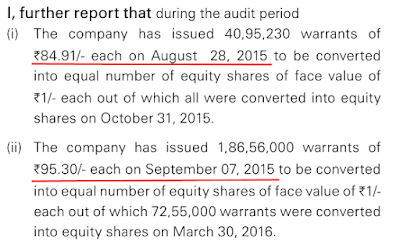 This is assuming that the promoters would have been able to buy 72,55,000 shares at the market price. The promoters are able to avoid the incremental cost of acquisition of shares if they would have bought the shares from the market as the market would have taken the share price higher. The share prices increase is even steeper when the market gets to know that the acquisition of shares by promoters would lead them to cross very significant milestones of 50% shareholding. The promoters get to buy an asset at a discount as in the above case promoters could benefit by ₹43.4 cr. when the conversion price of warrants is compared to the closing market prices of the shares. c) As per the exchange filing done by the company on December 28, 2016, the promoters have further exercised 39,17,454 warrants on December 28, 2016, when the closing market price of Granules India Ltd was ₹105 on BSE. Promoters currently have about 75,00,000 warrants that remain to be exercised at a fixed price of ₹95.30 irrespective of the prevailing market price. We believe that warrant issuance to promoters is effectively a way to transferring the economic value from non-promoter shareholders to promoters. If an investor analyses the sequence of events/activities, then it indicates that promoters are using the economic value of shares of Granules India Ltd to raise funds to buy more shares in the company at a discount to market price. In case the promoters are not able to service the loans taken by them by pledging of shares, then the selling of shares by those lenders would lead to a huge decline in share price of Granules India Ltd, which would hurt the wealth of all the shareholders whether promoters or non-promoters. Moreover, such loans taken by promoters incentivise them further to get high salaries from the company as well as get dividend payouts despite negative free cash flows (dividend funded by debt), so that they are able to service these loans. Effectively, one way or the other, it is the company and the shareholders who end up bearing the cost and repercussions of such loans irrespective of these loans being in the name of promoters. However, the benefit of these loans is primarily enjoyed by promoters as it leads to their increased shareholding in the company. Therefore, we believe that allotment of warrants by companies to promoters and then the exercising of the warrants by promoters by paying from the funds raised by pledging shareholding in the company itself is not a good practice. Investors should be fully aware of the dynamics that result in such situations. Granules India Ltd has done investments in Jeedimetla Effluent Treatment Ltd and Patancheru Envitotech Ltd, which it has classified under the trading category. Investors would expect the company to focus on investing in its own operations and monetize any of the investments, which are for trading in nature so that the funds can be used to meet the capex requirements, which are currently being met through debt and equity dilution. An investor should assess further whether these entities are related to promoters but strictly not in the statutory definition of related parties as per Companies Act. Granules India Ltd is currently available at a P/E ratio of about 19, which does not offer any margin of safety in the purchase price as described by Benjamin Graham in his book The Intelligent Investor. Overall, Granules India Ltd seems to be a company growing at a descent pace of 20%-25%, which historically has witnessed cyclical profitability margins. However, recently, the profitability margins have been witnessing steady improvement on account of change in product mix by the company as well as lower raw material prices. 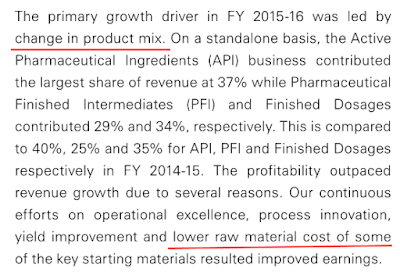 It remains to be seen whether the management is able to sustain these improved profitability margins in the future. Granules India Ltd has been doing significant capex since last 2-3 years, which has led to a deterioration in its operating efficiency parameters as it has not been able to utilize these investments efficiently. Assessment of self-sustainable growth rate (SSGR) and free cash flow (FCF) indicate that the company has been growing out of its means. As a result, it has to resort to debt funding and equity dilution to fund its capex and interest servicing requirements. Moreover, the company has plans for doing more capex in coming years. Therefore, an investor should keep a close watch on the project execution of the company as well as the debt levels on a continuous basis. High promoter salaries, payment of dividends out of debt proceeds, allotment of warrants and funding of warrant exercise by promoter by pledging their shareholding in the company leave a lot to be desired in the governance characteristics of the company. As a result, we believe that any investor who wishes to make an investment in Granules India Ltd should keep all these things in mind and monitor the company performance on a continuous basis along with promoter’s decisions. These are my views about Granules India Ltd. However, you should do your own analysis before taking any investment related decision about Granules India Ltd.